We have now launched our new range of Low Voltage Frost Free Refrigerators upright Electrolux. Cabinets are white in colour and operate on 12 volts. Also available in 24 volts upon request. 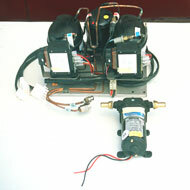 The dedicated 12 volts system has been designed due to a large demand from our customers. The FF280J thru the FF360J are available in left or right door opening. All models utilise the Danfoss BD5OF 12/24 volts compressor but have dedicated 12 volts automatic defrost heaters and controls. All evaporator's freezer / cooling plates are manufactured to suit your requirements in stainless steel and copper for long time durability. Moorebankmarine/Liverpool, Speciallising in Eutectic and Low Voltage Refrigeration. World Leaders in Low Voltage Frost Free Systems.